Filling up a bucket with water. 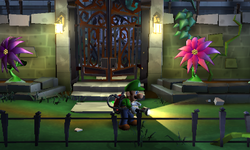 The Haunted Towers Entrance (Towers Entrance in the PAL version) is an outdoor area of the Haunted Towers in Luigi's Mansion: Dark Moon. The Haunted Towers Entrance is a small area with two planters that have two flowers in each of them. There is a large metal gate in between these two planters that leads to the Courtyard. On the right side of these planters is a broken pipe that releases water. To the far right, there is a dead tree that can kicked for various enemies or money to pop out, depending on the mission. Looking through the barred window by the tree gives Luigi a glimpse of the Hydro Generator. During A Job for a Plumber, there are multiple flowers that can be flashed with the Strobulb for money and kicking the tree yields five Gold Bars. In The Pinwheel Gate, three of the four purple are dried up and kicking the tree in this mission causes a gold bat to fly out. During Graveyard Shift, there are three dried plants and a carnivorous plant inside the planters. The pipe is blocked by a small red plant and kicking the tree causes two gold spiders to appear. When watered, one of the plants turns into a thorny plant that is used to kill the carnivorous plant while the other two plants turn into purple that the Strobulb can be used on to release many bills. In Pool Party, the planters have small red plants and dandelions instead of the large, purple flowers. Using the vacuum on these plants causes them to release a few coins. Kicking the tree in this mission causes a Gold Greenie to appear. In Doggone Key, only one flower gives out bills and a gold frog comes out of the tree when it is kicked. This page was last edited on September 12, 2017, at 20:09.